The Song of Songs is an adulation of one’s beloved and praise of conjugal bliss. King Solomon celebrates his love and admiration for his Shulamite bride and vice versa. Some also see this book of the Bible as Solomon’s interpretation of God’s incomparable love for the children of Israel. It balances demureness and eroticism with a poetic flair. 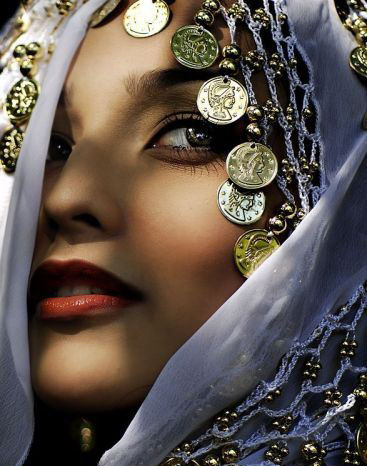 The maiden(Solomon’s bride) in the verses shown above paints a picture of her own beauty: confident, exotic, mysterious and dark like the tents of Kedar, like the tent curtains of Solomon(v.5). It appears that generally women of a high social class were of a fairer complexion than their less privileged peers because of birth or non-exposure to labor in the sun. Therefore, it was expected that the appearance of the bride of a king would satisfy traditional norms. However, the ebony skin of the royal bride-to-be seems to be detracting attention from other aspects of her loveliness. She mentions that the “anomaly” in her pigmentation is a result of the treachery done to by her brothers because they forced her to do laborious work in the sun. Although she decries their treatment towards her, she does not appear perturbed by the change it has caused in her complexion. Ironically, her friends address her as “O thou fairest among women”(1:1, 2:1) in subsequent verses and make no mention of her darkness. They use “fair” to praise her beauty – a description that aligns with one of Webster’s definition of pleasing to the eye or mind, especially because of fresh, charming or flawless quality. Webster’s dictionary also defines the word as not dark and relates to skin pigmentation and not looks. It seems though that the first definition is what her friends want to express in order to assure her that her loveliness is more than just skin-deep. Now that I’ve mentioned “skin deep”, the word “opaque’ comes to mind. It means not able to be seen through, not transparent. The darkness of the Shulamite maiden may temporarily block out the brightness of her inner charm to some spectators who may see beauty as merely skin-deep but it is visible to her friends and lover. Although there is no question that the young lady is pleasing to the eye, here we see a situation that bears out the adage that beauty is in the eye of the beholder.